On behalf of the AMTA, President Geiger has provided a document with responses to the questions and concerns raised during the MAR President’s Forum. To read the original document from the Presidents Forum, click here. A HUGE thanks goes to President Geiger for compiling this information for us and for being open to the dialogue. MAR President Gabby Ritter provided a concurrent session at the MAR Regional Conference in Harrisburg, PA in March for “all MAR members to voice their ideas and thoughts concerning MAR and AMTA” (session description, MAR app). A relatively small group gathered, notes were taken and disseminated to the MAR membership via social media outlets and their newsletter, Tuning Into Rx Music early in May. In a call with MAR leaders President Ritter, Past President Julie Neal and President Elect Mike Viega on May 23rd, following the distribution of the Forum Notes, I offered to provide responses so that members and others receive answers to their questions. Remember that anyone with a question about a national level matter or a concern related to AMTA business of any kind can always 1) call or email the AMTA President; 2) call the National Office at 301-589-3300; and/or 3) send an email to Dr. Andi Farbman, our Executive Director, any individual staff member or to info@musictherapy.org. It is hoped that the information provided will answer the questions asked and concerns shared. Thanks to President Ritter for disseminating this response. A question arose about other online platforms that music therapists utilize. AMTA members who participate in these forums can direct people to the communication sources above so clear and accurate information can be obtained. If it can’t be found at musictherapy.org, regional and national leaders are available for assistance. My contact information is on musictherapy.org and I am happy to help with information dissemination. In addition, there’s always the option of contacting info@musictherapy.org, which is a monitored e-mail address and replies are usually provided within 48 hours. The way that the regions relate to the AMTA Board of Directors, Assembly, and Committees can be found in detail in the Bylaws here: http://www.musictherapy.org/members/bylaws/. The suggestion of an infographic is a great idea for all of us visual learners and will be explored. When one joins AMTA, one is automatically a member of the regional organization of residence. Increases in AMTA membership increase the number of members in the region. The Assembly of Delegates is comprised of 60-70 members elected from the 7 regions, with the number of delegates per region dependent upon the total regional membership. The Assembly is the policy-making body of the organization. The 15 Standing Committees of the AMTA Board of Directors include members appointed from each region, in addition to ad hoc members as specified in the bylaws. The Education and Training Advisory Board, Ethics Board, Judicial Review Board, and Student Affairs Advisory Board are comprised of nationally (and sometimes regionally) appointed members, per the bylaws. Because the regions are under AMTA’s tax umbrella (a benefit from AMTA’s nonprofit status as a 501(c)(3) organization), regions are required to file IRS 990 forms along with AMTA annually. Because of AMTA’s nonprofit status, the regions are able to receive charitable contributions. Thanks to the efforts of all regional Treasurers, regional Presidents and AMTA Executive Director Andrea Farbman for the continued work that the annual 990 filings require! Last year, in response to member interest, the AMTA Board of Directors began posting the Board Books online. Previously, members who requested board books were sent them individually. Because the work of our association is so extensive, the Board books are jam-packed with information from AMTA Officers, Committee Chairs, Additional Boards, Task Forces, Regional Presidents, and National Office Staff and consultants. They are posted after the meetings of the Board of Directors, in case additions are made so that the complete proceedings are available. You can find them here, after highlights of important content of each Board meeting: http://www.musictherapy.org/members/official/board_directors/ Also, all Assembly members receive the Mid-Year and Annual Board Books for review. Login to www.musictherapy.org to access “News from AMTA Committees and Boards” under the “Member Resources” drop-down menu. Because the Board Books are reports of works in progress, they are best suited under the members-only section of the website. Once work has been completed and approved, it is made public as it relates to the mission of providing education and access. Board meetings are, indeed, open to the public as part of our responsibility as a non-profit organization. We welcome having visitors at the Mid-Year and Annual meetings. A question was raised regarding the use of executive session, during which observers are not permitted. Executive Session, per Robert’s Rules, is employed when the subject matter being discussed needs to remain confidential and the privacy for the parties involved needs to be protected. Personnel issues and legal discussions are examples of topics often discussed in executive session. For example, as the sole employee of the Board of Directors, the Board is responsible to review the performance of the Executive Director on an annual basis. This conversation is private and the standard protocol is to hold it in executive session. Further, it is the responsibility of a well-run Board of Directors to know when confidentiality issues would hinder discussion or violate an individual’s right to privacy and, therefore, move into executive session to safeguard individuals as well as the organization. Typically, the time spent in executive session amounts to no more than 5% of the total number of hours of meeting time. In setting the agenda, an attempt is made to provide notice when the executive session(s) will occur; however, circumstances sometimes require one or more unplanned executive sessions. The majority of the voting members of the Board are required to approve going into executive session. The use of executive session is a standard operating procedure of organizations. On a regular basis, AMTA members and National Office staff are advocating for increased job opportunities. These endeavors can be seen in state advocacy efforts around the country. Members are opening small businesses and employing music therapists. For example, our Director of Government Relations, Judy Simpson and Director of Professional Programs, Jane Creagan, regularly provide letters and hold conference calls in support of job creation or to prevent job loss. In addition, our Executive Director, Andrea Farbman recently attended meetings at NIH and the Pentagon, which have already contributed to job creation and likely will lead to more (a benefit of the National Office location in Silver Spring, MD is the proximity to advocacy opportunities). This information is posted at www.musictherapy.org under “Latest News” (on the right side of the page, scroll down to see highlights). For a listing of jobs, login and check out the Job Center here: http://www.musictherapy.org/members/jobcenter/ . There are so many listed, I had to scroll down twice! AMTA does not charge a fee to employers listing jobs so that we can fully promote and shape all employment opportunities. As I refer to the website, I recall the concerns expressed during this forum and during my regional conference tour. 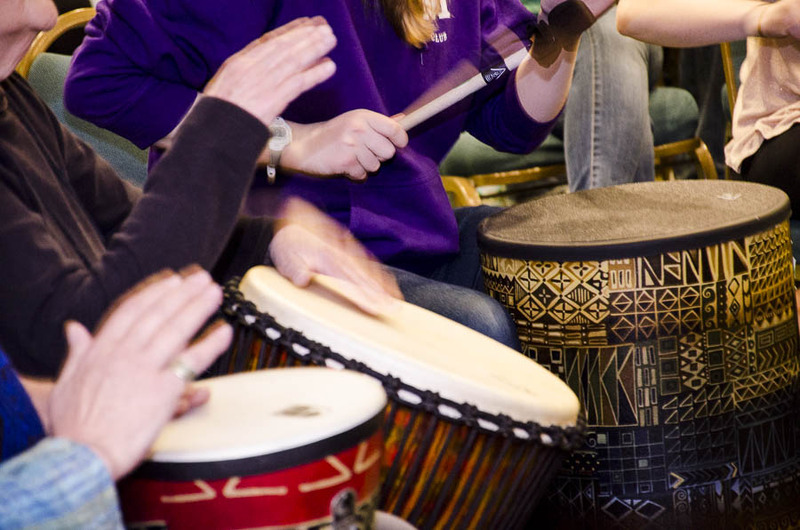 At the same time, I’ve heard from students and prospective students how amazed they are by the sheer volume of information that can be found at www.musictherapy.org and how grateful they are that so much is available for them. The National Office staff have been working on potential improvements and enhancements along with an assessment of user experiences as we approach the five year anniversary of the latest version of the website. Having said that, revising and updating the AMTA website is a daily job and, therefore, it is a dynamic “animal.” Staff want to maximize the accessibility of musictherapy.org. Information will be presented to the Board at the upcoming Mid-Year meeting to determine the financial feasibility of improvements. In looking at the membership trends over the past several years, AMTA professional membership has increased. What was shared in November at the National Conference is the fact that out of nearly 6800 MT-BCs nationwide, only one-third are AMTA members. Based on the summary of Board activity (previously mentioned), you can see that the Board has taken on an initiative to work in tandem with the Membership Committee to increase the percentage of MT-BCs who are also AMTA members nationwide so that many more than 1/3 of us are supporting the promotion and progress of the entire profession. Hearing member needs some years ago, AMTA continues to provide a payment plan for membership dues. Members can pay over a period of months and still reap the same numerous benefits of those who make payments in one lump sum annually. There is a nominal fee associated with payments plans to offset the additional costs of administering them (which is typical throughout the industry). Specifically to AMTA, additional staff time is required for accepting, tracking and following up on payments as well as shipping out resources (e.g., journals) at times different from the regular shipment dates. Unfortunately, data show that over the past few years, many who use the payment plan for their convenience are not following through to complete their payments. This adds to the cost of maintaining the program. The AMTA Board of Directors has the complete fiduciary responsibility for the organization as provided in both federal and state laws governing non-profit 501(c)(3) organizations (see also AMTA Bylaws Article VI, Section 1 and Article IV, Section 11). Decisions are made based on the concept of “knowledge based governance” (Glenn Tecker Consultants) and guided by the tenets outlined in Ten Basic Responsibilities of Nonprofit Boards by T. Ingram. The Treasurer works with the Executive Director and the Financial Advisory Committee (comprised of Board members and Regional Treasurers) to present the annual budget to the AMTA Board of Directors. A fluid document, the budget is reviewed and adjusted regularly, as needed. An annual audit is conducted by an outside firm in the fall and the results are provided to the Board. You can search the annual audit or click here: http://www.musictherapy.org/about/audit/. This information is readily available to the public, as required by law. The Board of Directors is committed to accountability for its decisions and every effort is made to make informed decisions that are in the best interest of AMTA members and the public we serve through our mission. Lengthy Board discussions often occur in which all perspectives are heard and considered; the ultimate goal is consensus, which typically occurs so that we can move forward in the most productive manner. Sometimes the answers to your questions are simple; other times, they are more complex. Regardless, the more direct the communication, the better chance we have for clear answers. I encourage you to email or pick-up the phone and call the leaders and/or staff who are closest to your question. Those who have served or worked in organizations may realize that the wheels of change sometimes move slowly. Some concerns are expressed repeatedly because they may not be addressed in the way that one desires. As an AMTA member my entire professional life, I recall concerns in the past that have been readily and repeatedly addressed. And yet, because it’s not to the specifications of those who express concerns, the changes (or lack thereof) are deemed unacceptable. Clear, direct communication is key. Thank you for the opportunity to provide you with responses to questions and concerns expressed during the MAR President’s Forum. It is an honor to serve; I remain available to you for questions. President, American Music Therapy Association, Inc.